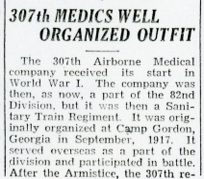 The 307th Airborne Medical company received its start in World War I. The company was then, as now, a part of the 82nd Division, but it was then a Sanitary Train Regiment. It was originally organized at Camp Gordon, Georgia in September, 1917. It served overseas as part of the division and participated in battle. After the Armistice, the 307th returned to the United States and was demobilized at Camp Dix, New Jersey in May, 1919. In view of its record in World War I, the unit was reorganized as the 307th Medical Regiment. It was redesignated as the 307th Medical Battalion, and finally became the 307th Airborne Medical Company, a part of the new 82nd Airborne Division. 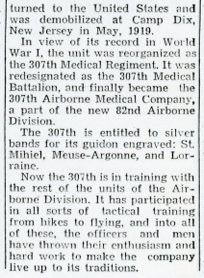 The 307th is entitled to silver bands for it's guidon engraved: St. Mihiel, Meuse - Argonne, and Lorraine. Now the 307th is in training with the rest of the units of the Airborne Division. It has participated in all sorts of tactical training from hikes to flying, and into all of these, the officers and men have thrown their enthusiasm and hard work to make the company live up to its traditions. "All American - Anniversary Edition"